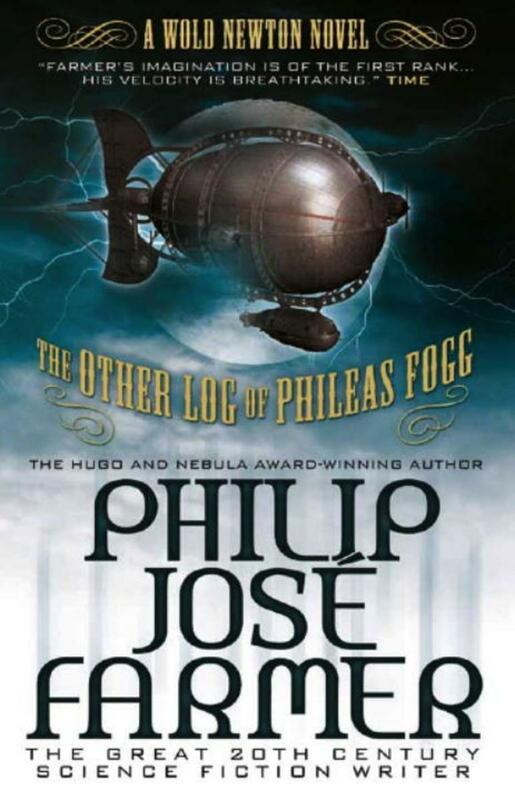 The lovely guys at Titan Books offered me a sneak preview of the first chapter of The Other Log of Phileas Fogg by Philip Jose Farmer. So share and share alike, here it is! Phileas Fogg was said by Verne to be a bearded Byron, one who was so tranquil that he might live a thousand years without getting old. Was this statement about his possible longevity just a coincidence, a flying thought which chance happened to fit with the wings of truth? A millennium of life was exactly what Fogg had been promised. In 1872 he was said to be about forty years of age, and so he was. But the Eridanean elixir does not affect its work until the body is about forty years old, and then it rapidly takes hold. Today, Fogg would look as if he had aged perhaps a year or two, if he is still alive. The chances are that he is alive and well somewhere in England. Can anyone point to a gravestone on which is carved his name, the date of his birth, 1832, followed by the date of his death? They cannot. Mr Fogg was tall and well-shaped and had a handsome face, which is to be expected from one who so closely resembles Byron. His hair and whiskers were light, which may mean in Vernese that he was blond or had light brown hair. The colour of his eyes is not mentioned by Verne. A Scotland Yard report, however, still available to the researcher who is diligent enough to dig for it, gives them as dark grey. This is to be expected in a member of a family noted for its grey eyes. His face was pale, a natural consequence of exposure to the sun for only once a day during the time it takes to step off one thousand and one hundred and fifty-one consecutive paces. His teeth, unlike the typical Englishman’s of that day, were magnificent. He had lost none to the dental decay which afflicted the people of Albion in the mid-nineteenth century. This quality, like the grey eyes, seems to have been a genetic factor. On the other hand, since he was given a number of elixirs during his childhood, the dental health may have resulted from a drug which originated light-years and millennia away. At the time this story opens, Wednesday, 2 October 1872, Mr Fogg seemed to have no relatives. He lived at No. 7, Savile Row, where the only other occupant was his valet. He had acquaintances but no close friends. His sole recreations were the walk from his house to the Reform Club, reading the newspapers, and playing whist. According to Verne, he had been living like a pendulum on a clock for many years. Actually, the “many years” were only four, from 1868 to 1872. But his presence was so full of “thereness” that people thought of him as an old fixture, like the milk wagon or even a house. Fogg demanded that his shaving water be exactly at 86° Fahrenheit. On this morning, his man, James Forster, appeared at the right time with the water, at thirty-seven minutes past nine. He set the bowl down by the basin, and Mr Fogg removed the thermometer from its water. It registered 84° F. There was no excuse for this deficiency. Few though his duties were, (hey must be performed precisely a( the precise time. He was to awake his master exactly at eight in the morning. Twenty-three minutes later, he was to appear with a tray on which were tea and toast. Verne does not say that these had to be at a certain temperature, but we may assume that they had to be. Ten minutes later, Forster would remove these. There remained for him only the shaving-water at 9:37 A.M. and the dressing of his master at twenty minutes to nine. At 11:30 A.M., no few seconds given or taken, Mr Fogg would go out the front door, and he would come back through it as the clocks of London struck midnight. Between his departure and arrival, his servant had little to do. He did have to clean up a little, arrange for a cleaning woman to come in once a week, ensure that his master’s clothes were cleaned and pressed, the beds made, pay a few bills, and so on. Except for the inhuman requirements of the schedule, James Forster was his own master. Why, for instance, did Forster deliver the shaving-water at two degrees less than that required? All he had to do was to check the thermometer. Why didn’t he, when he knew it was so important? The answer is that he did check it. Mr Forster had waited until the temperature of the water had dropped to 86° before carrying it out of the kitchen. He knew very well that by the time he reached the bathroom on the third floor, the water would be below the desired temperature. Nor did he look perturbed when informed by Fogg that he was dismissed. Mr Forster did not reply, but he surely must have been thinking that very few employers would regard two degrees of Fahrenheit as anything serious or even worth commenting on. Neither man smiled at the end of this conversation, though it’s difficult to understand how they could refrain. Though there were no witnesses and no one could possibly have seen or overheard them, neither let down his guard. If there had been a hidden camera or electronic ears, nothing untoward would have been recorded. Of course, in 1872, neither of these devices existed. What about the very slight whirring that could be heard in this house when neither man was speaking? To what could that be attributed? And what about the large mirror in Mr Fogg’s bedroom? Could this possibly be a one-way piece of glass, and could there be equipment behind it, equipment which even 1972 A.D. might find very advanced indeed? Whether or not the house was bugged, it was certain that Fogg and Forster never said a word or made a gesture which was not expected from people of their class and in this situation. There was nothing to indicate that 2°F. could be a signal for the dismissal of one servant and the hiring of another. Or that the famous bet made in the Reform Club was also the result of this signal. This may be an excellent reason for Mr Fogg’s eccentricity of undeviatingness. To fire a man because he offers water two degrees off the standard is to be eccentric. Such behaviour in a “normal” man would at once attract attention. But such behaviour was to be expected from Mr Fogg. Indeed, if he had not reacted as he did, he would have been regarded suspiciously by any hypothetical hidden observer. At twenty minutes before ten, Forster assisted Fogg to dress. Fifteen minutes later, Forster left the house and took a cab to the employment agency specializing in valets, footmen, maids, and cooks for the well-to-do. Phileas Fogg sat down in his armchair and assumed his habitual posture. His spine was straight; his shoulder blades were firmly pressed against the back of the chair. His feet were close together. His hands were placed palm down on his knees. His eyes were fixed upon a large clock across the room. This instrument indicated not only the customary seconds, minutes, and hours, but the day, month, and year. He did not move except for the rise and fall of chest associated with every living mammal, even Mr Fogg, when he is breathing normally, and for the blinking of the eyelids. Despite what is said about the unblinking gaze of villains in the penny dreadfuls of 1872 or 1972, no one with eyesight can do without blinking. The results are too painful. And so Mr Fogg blinked, as he would have voluntarily done even if he had not been naturally required to do so. He doubted that there were any concealed spies, human or mechanical, in the house, but it was possible. He lived as if he were an automaton—almost like Mr Poe’s mechanical chess player—for two reasons. One, he had been taught to do so by his foster-father. Two, though he lived quietly, he did so conspicuously. There were few aware of his existence, but these few were very aware. His very standingoutness, however, was the quality to allay the suspicions of the enemy. They would believe that their enemies would be doing all they could to appear normal, to merge into the human herd. Therefore, Mr Fogg, by his behaviour, would convince them that he could not possibly be hiding from them. Despite this theory, there was some evidence that Fogg was under surveillance. And so Fogg, whether in company or alone, always acted as Fogg should. He had done so for such a long time that he would have found it unnatural to do otherwise. The image was he, and he was the image. But this was to change very soon. It may be that the premonition of this, indeed, the certainty, made his heart beat faster. But was it not this man who said, “The unforeseen does not exist?” Was he, as he sat unmoving in the chair, using his brain as a computer to extrapolate the most likely of the futures? Did his usual training as a child enable him to switch certain neural circuits and stimulate certain patterns in his brain into computing unconsciously and with all the speed of modern electronic brains? Could he visualize the statistical chances of an occurrence in potentia? Fogg never says so in his log, but there are some statements that sound as if he were referring indirectly to such a talent. If he could do this, then he must have known that he could not be sure that such and such a thing would be inevitable. And so, though in a sense the future contains no unforeseen, it holds no inevitabilities. If it did, and these could be anticipated, one side or the other in this secret war would long ago have acknowledged defeat. In fact, the war might have been over before it began, since computation would show both sides who eventually win. Why did Forster thus announce the applicant? The new man had not yet been interviewed, let alone hired. Why would Forster speak as if the matter were settled? Was it a slip on his part, and the matter had indeed been predetermined? If so, Fogg’s expression did not change, and Verne says nothing of Forster’s. Why should he? Verne knew nothing of what was taking place behind the scenes. A man entered and bowed. He was short and stockily built; had a pleasant face with red cheeks and bright blue eyes; his hair was brown and always looked windblown. Fogg had given the first code of inquiry when he had asked him if his name were John. And the Parisian had replied with the password when he said his name was Passepartout. Just as the name of Fogg indicated a certain role in the organization, by a happy coincidence, so Passepartout indicated his role. But the Frenchman’s name was not the one with which he had been born. He had been dubbed Passepartout—”Passes everywhere”—for a good reason. It indicated more than the Frenchman’s wanderlust and instability. Passepartout, at Fogg’s request, gave his background. He had been a wandering minstrel, though not necessarily of rags and tatters. He had also ridden horses in circuses, and he had danced on the high wire, like the famous Blondin. If Passepartout could emulate the feats of this fellow Gaul, as he hinted he could, then he should have stuck to the tightrope. It was Blondin who first crossed above Niagara Falls on a wire 160 feet above the water and 1100 feet long. This he did many times, blindfolded, on stilts, carrying a man on his back, sitting down on a chair and eating a meal, and so on. Only eleven years ago he had appeared at the Crystal Palace in London and there, wearing stilts, had somersaulted on a rope 170 feet above the ground. It was not to be supposed that Passepartout was the equal of Blondin, but he may not have been far behind in skill. In any event, he had quit the high wire to teach gymnastics for a while. Then he became a fireman in Paris, but he had quit that five years before to take up valeting in England. Surely this was a strange switch of professions, but he explained that he was tired of the dangerous and the unsettling. He desired the quiet life. He was now out of a position, but, hearing of Mr Fogg, than whom no one led a more strictly scheduled and peaceful life, he had presented himself as a desirable valet. He did not even want to use the name of Passepartout anymore. This was strange, because from whom and when would Mr Fogg have heard about Passepartout? Until a few hours ago, he had not even thought about getting a new servant. Since he had fired Forster and sent him out to get another servant, he had communicated with no one. He had neither inserted an ad in the papers, written a letter and received a reply, nor used the telephone. The latter he did not have, since Mr Alexander Graham Bell was only twenty-six years old and a little less than four years from filing his patent on the electric speaking telephone. Mr Fogg could have sent Forster out to the nearest telegraph office, but Verne says nothing of this. No, just as Forster’s introduction of Passepartout was a slip on his part, so Fogg’s comment on the recommendation was his slip. The question is, were these slips intentionally made to affect the hypothetical hidden observer in a certain fashion? If the unforeseen truly did not exist for Fogg, would he have slipped? And if Fogg made a mistake on purpose, then it’s safe to presume that Forster did so, too. This means that all three, Fogg, Passepartout, and Forster, were cognizant of a certain plan. “You know my conditions?” Fogg said. The Frenchman’s answer indicated that Forster had filled him in on the way from the agency. “You are too slow,” Mr Fogg said. Passepartout replied that that was impossible. Phileas Fogg rose, took his hat in his left hand, put it on his head, and walked out. Mr Fogg was thoroughly satisfied that Passepartout was the man sent to help him in his new venture, whatever that was to be. Forster had checked him with certain passphrases at the agency. The bit about Passepartout’s watch being slow had been another method of identification. In addition, the Frenchman’s name had indicated his function, and the “enormous” watch was so large because it contained more than a timepiece. Mr Fogg’s taking his hat with his left hand had been the final signal, since he was right-handed. If he were left-handed, he would have used the right. Passepartout had observed his last confirmation and so was also pleased. After Fogg left the room, he stood listening for a moment. The door to the street shut. That would be his ally and master leaving at exactly 11:30 A.M. A few seconds later, the door closed again. That would be James Forster going to wherever the plan dictated. There Forster would make another move in the secret and martial chess game that had been going on for two hundred years between the Eridaneans and the Capelleans. Keep an eye out for a full review here in the near future!